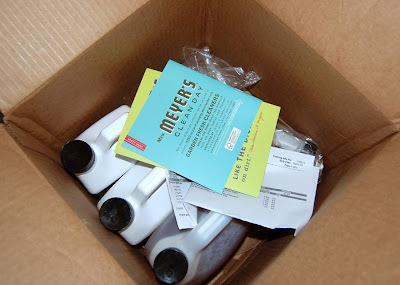 A box of Mrs Meyer's Clean Day arrived at my doorstep yesterday and it was like Xmas came early this year. Anyone not familiar with Mrs Meyers should try it... not only do they smell great but the packaging is attractive too! (Funny enough, I first tried the hand soap when I bought it for the pacakging when I was staging a bathroom in a home I was selling.) Online, shipping is free on orders $50 or more until June 13th. Otherwise, find a store near you that carries their products on their store locator. Most products are biodegradable and all of the packaging is recyclable. Even the pet shampoo is great! Lemon Verbana - Dish Soap, Countertop Spray, Liquid Hand Soap, Hand Lotion, Hand Soap Refill, Surface Scrub, Automatic Dishwashing Liquid, Toilet Bowl Cleaner, Stainless Steel Spray, Laundry Detergent, Fabric Softener, Candle.